The irony of the music industry is all too common. Indie labels kicking and scratching to establish themselves, some trying to discover the next big thing, while others forge their own paths, creating their own sound if you will, and watching as a nation latches on for said sound's fifteen minutes of hype. In the midst of this there are those bands that seem to come out of nowhere. Not really fitting in with any flavor of the month or hot ticket, doing what they love to do, somewhere along the line finding themselves on the radar, with a fan base that, much like the band, seems to come from nowhere. Remy Zero is one of the bands that never really fit in. Like the kid you went to high school with, the one who's name you could never recall when you saw him in the halls. But ten years later when he gains notoriety - movies, the stock market, music - you instantly remember the time he was in your science group. As Jeffrey Cain, Remy Zero's guitarist will attest to, Remy Zero just doesn't care. They want to make great music, regardless if someone thinks they're the popular kid or not. "We've never known where we fit in. I don't really pay attention to that," Cain says so casually. "It's funny though, we tried and tried and we couldn't get an indie label to put out our record and then it ended up that DGC signed us." So goes the Remy Zero story. "We hover in our own world and that's fine," elaborates Cain. "We've never really been part of a scene. We don't fit in with the lo-fi, emo, or on labels like Merge or Touch N' Go. We've always been outsiders and not associated with any scene. Indie cred means nothing to me." Indie cred may mean nothing to Remy Zero, but their live show means everything, as it has been one of their biggest selling points in their decade long existence. "Most people like us better live than they do on record. Our records are dense with lots of information," remarks Cain. "To make our records, we don't have to make it sound lo-fi or cheap," Cain says in regards to indie purists' belief that good records must be recorded on a small indie budget. "We want to make good records regardless of any tag you place on it, and if we can make a good sounding record in a big studio, that's great." The band's latest, TheGoldenHum is a prime example of their ability to make elaborate, complex pop records with plenty of instrumentation, taking advantage of their major label status and ability to have superb production, all the while releasing basic rock songs with substance and no frills. 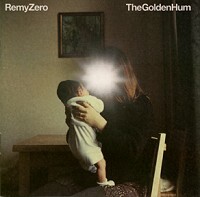 TheGoldenHum is a new dimension in Remy Zero's musical career. For the first time they recorded in a mainly live setting, rather than tracking individually, as Cain explains to me. "Our last records were art experiments. They were more studio works, where we were building upon tracks with different moods, track by track. Our new record was written on acoustic guitars and tracked live. We then built upon the foundation from there. We're a live band, so it is a lot more like us. "On the old records it always felt more modern in a sense that isn't exciting to me. Modern music does not have the emotional depth that some of the older, more soulful stuff does. So, on the new album we set out to catch the live aspect of the band. 'Bitter' and 'Impossibility' were recorded completely live, no click tracks, late at night in a daze. We've never captured that before. Recording songs in a live setting is a more documentary style for us. It's a truer movement. We'll look back and go 'we did that?'." 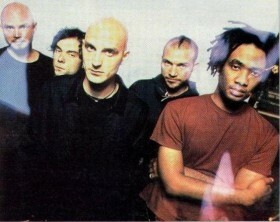 Unlike most major label bands, Remy Zero's label, Elektra Records, had enough faith in the band to allow them to record the record they wanted. Taking the suits out of the studio and placing them in the offices where they belong, the label eagerly awaited the finished Remy Zero record, no questions asked. "With Elektra Records we were in a situation we've never been in before. They let us make the record we wanted to make," remarks Cain. "Elektra didn't hear the record until the final mix, which is very rare for a major label. We didn't give them the record they were expecting, but in the long run they liked it better and they were surprised. They've been very supportive. We told them we wanted to tour all this year and they backed it. Also, Elektra wanted us to make a video, gave us the money, and we made a video. Basically, they gave us money to make a high budget art film." Recording for the first time in a live setting may seem like a big leap for a band used to building their songs through the magic of studio wizardry. But, after the band landed in L.A. with no clue what they were going to do or how they were going to make another record, the idea to record live seems like a new beginning for a band that has re-invented themselves and grown with every album. Cain gives me a little insight into the mindset behind the process of making their latest album. "When we were writing and recording TheGoldenHum we were going through a strange time period. We were going through break ups with marriages and our manager. Whatever we were going through, we found ourselves in L.A. figuring out how we were going to make another record. We took our lessons of loss and betrayal and made something beautiful out of the mess that is our lives." What is next for Remy Zero? 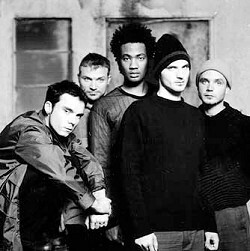 "Our plan for 2002 is to travel and write new music. We have tape machines on the road and are always recording," Cain informs me. "We like to travel and meet people, and write songs while we do that." Pausing for a second, Cain ends the interview by saying, "we've been putting out records and touring for ten years. We just don't want to burn out. And we don't want to hoard our music anymore. We want to give it away."